Norwich skipper Grant Holt scored a hat-trick as the Canaries deepened the problems of East Anglia rivals Ipswich with a convincing victory in a fiery encounter at Carrow Road. 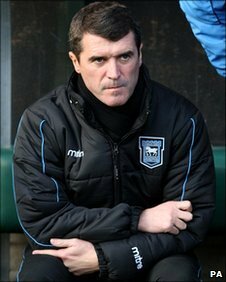 Ipswich have numerous players out injured but they have nonetheless now lost four straight league games as their bright start to the campaign slowly becomes a distant memory, increasing the pressure on manager Roy Keane. 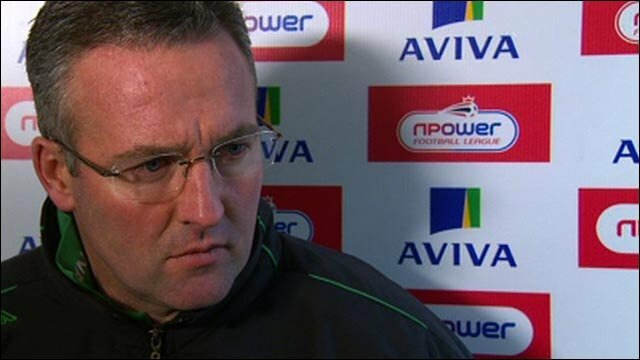 But the result lifted Paul Lambert's Norwich up to fifth in the Championship table after a deserved victory against a side that were awful in defence for most of the contest. Holt's first two goals came after he dispossessed an opposition defender, while Damien Delaney saw red in the first half for a professional foul after he too had been caught on the ball and subsequently brought down the Norwich striker as he tried to atone for his error. Prior to his dismissal, Delaney had scored Ipswich's equaliser with a far-post header during an action-packed opening half that saw Norwich lead 2-1 at the break. It was a lot tighter after the restart but two goals in as many minutes put the result beyond doubt as Holt slotted home from 14 yards before substitute Wes Hoolahan craftily lifted the ball over Marton Fulop. Derby matches are often tense and cagey encounters but this game exploded into life as early as the second minute when Holt crudely hacked Jack Colbeck to the floor. Holt was arguably fortunate to escape with a yellow card, while Grant Leadbitter was also booked after man-handling the Norwich striker as he lay on the ground. A melee of sorts followed as the atmosphere inside a packed Carrow Road turned red-hot, in stark contrast to the freezing temperatures around the ground. The home crowd were incensed shortly afterwards when referee Keith Hill did not award their team a penalty when Ipswich defender Gianni Zuiverloon, making his debut after signing on loan from Hull, appeared to foul Andrew Surman inside the area. But they were sent into raptures when Holt put the Canaries ahead after catching Darren O'Dea in possession before superbly finishing with a strike across goal after eight minutes. There was a suspicion of a handball by Holt as he gained possession but that went unnoticed by the referee. Norwich seemed to be able to pick holes in the Ipswich defence every time they attacked and Henri Lansbury fired over from the edge of the box before Andrew Crofts shot weakly at goal from six yards as they threatened to score a second. But for all that Ipswich were poor at the back, they did play some enterprising attacking football, with striker Tamas Priskin particularly effective. He forced John Ruddy into action after a surging run into the box and later knocked Leadbitter's raking free-kick back across goal for Delaney to equalise with a close-range header. The game appeared to be back in the balance but the increasingly influential Lansbury, who signed on loan this week from Arsenal, unlocked the Ipswich defence with a brilliant through-ball that Holt collected before shooting beyond Fulop from 16 yards. And the game turned decisively after 37 minutes when Delaney, in another act of suicidal defending, was caught in possession by Holt. The striker advanced towards goal but was brought down by Delaney, who was correctly sent from the field. Holt failed to convert a cross from Russell Martin and Fulop athletically saved a header from Surnman as Ipswich somehow reached the break without conceding again. The Tractor Boys regrouped at the break and they looked a lot more solid in the second half, although Chris Martin was gifted the space to shoot from 20 yards while Holt had a weak header saved and another that missed the target as Norwich looked most likely to score the game's next goal. And Holt, who received a generous round of applause when he was substituted in the final few minutes, put the result beyond doubt when he tucked home a lay-off from Chris Martin. A raking pass from the left was then flicked on by Holt and Chris Martin into the path of Hoolahan, who ensured it would be an afternoon to remember for the home fans with a delayed finished, chipping the ball over Fulop to seal Norwich's most emphatic win over their rivals. 90:00+4:28 The game is over, as the referee blows his whistle. 90:00+4:14 Carlos Edwards crosses the ball, Headed effort from deep inside the area by David Norris misses to the left of the goal. 90:00+3:22 The ball is swung over by Korey Smith, Chris Martin takes a shot. Save made by Marton Fulop. 90:00+2:27 The ball is delivered by Russell Martin, David Norris gets a block in. 90:00+1:22 The referee blows for offside against Andrew Crofts. Indirect free kick taken by Marton Fulop. 90:00+0:56 Russell Martin delivers the ball, Tommy Smith manages to make a clearance. 90:00+0:14 Marton Fulop takes the indirect free kick. 89:49 Booking Simeon Jackson goes into the book for unsporting behaviour. 88:54 Booking Jack Colback receives a caution for dissent. 88:20 Corner taken by Jack Colback from the left by-line played to the near post, Simon Lappin manages to make a clearance. 88:05 Grant Leadbitter has an effort at goal. Blocked by Leon Barnett. 87:55 Outswinging corner taken from the right by-line by Carlos Edwards, clearance by Elliott Ward. 87:26 Jack Colback crosses the ball, clearance by John Ruddy. 86:54 A cross is delivered by Colin Healy, Leon Barnett manages to make a clearance. 84:05 Korey Smith challenges David Norris unfairly and gives away a free kick. Direct effort from the free kick comes in from Grant Leadbitter, save by John Ruddy. 84:05 Substitution Simeon Jackson on for Grant Holt. 80:34 Substitution Troy Brown is brought on as a substitute for Tamas Priskin. 79:58 Substitution Korey Smith comes on in place of Henri Lansbury. 79:37 Colin Healy sends in a cross, Headed effort from deep inside the penalty area by Darren O'Dea misses to the left of the goal. 77:49 Chris Martin provided the assist for the goal. 77:49 GOAL - Wesley Hoolahan:Norwich 4 - 1 Ipswich Wesley Hoolahan finds the back of the net with a goal from inside the six-yard box low into the middle of the goal. Norwich 4-1 Ipswich. 75:51 Assist by Chris Martin. 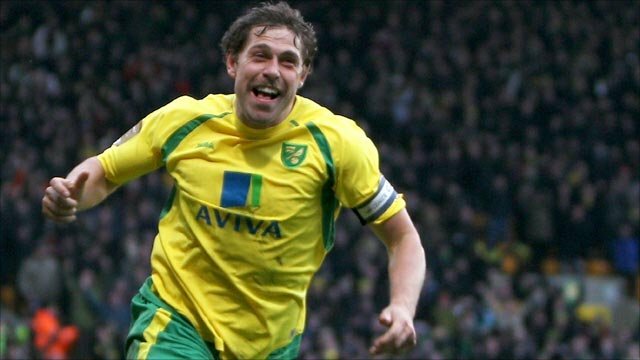 75:51 GOAL - Grant Holt:Norwich 3 - 1 Ipswich Grant Holt finds the back of the net with a goal from the edge of the penalty box to the bottom right corner of the goal. Norwich 3-1 Ipswich. 75:43 Henri Lansbury crosses the ball. 73:08 Grant Holt fouled by Carlos Edwards, the ref awards a free kick. The ball is sent over by David Fox, Effort on goal by Henri Lansbury from just inside the penalty area goes over the target. 72:30 Free kick awarded for a foul by Leon Barnett on Rory Fallon. Grant Leadbitter restarts play with the free kick. 70:41 Simon Lappin produces a right-footed shot from long distance which goes wide right of the goal. 70:35 Chris Martin delivers the ball, Tommy Smith manages to make a clearance. 70:23 Simon Lappin sends in a cross. 69:30 Outswinging corner taken from the right by-line by Carlos Edwards, Header at goal by Tommy Smith. 68:59 Substitution (Ipswich) makes a substitution, with Rory Fallon coming on for Gianni Zuiverloon. 68:44 Grant Leadbitter produces a drilled right-footed shot from 25 yards. Clearance by Elliott Ward. 68:27 Shot by Tamas Priskin. Blocked by Leon Barnett. 67:28 Free kick awarded for a foul by Jack Colback on Russell Martin. Direct free kick taken by John Ruddy. 67:06 The ball is crossed by Henri Lansbury, clearance by Gianni Zuiverloon. 66:46 The ball is delivered by Russell Martin, Chris Martin takes a shot. Brilliant save by Marton Fulop. 66:17 The ball is delivered by Gianni Zuiverloon, clearance made by Elliott Ward. 65:38 Wesley Hoolahan challenges Tommy Smith unfairly and gives away a free kick. Direct free kick taken by Marton Fulop. 64:21 Corner taken right-footed by David Fox from the left by-line, Headed effort from deep inside the penalty area by Grant Holt misses to the left of the goal. 63:40 Substitution Wesley Hoolahan on for Andrew Surman. 63:28 Henri Lansbury produces a cross, blocked by Tommy Smith. 63:21 Inswinging corner taken left-footed by Andrew Surman, Gianni Zuiverloon manages to make a clearance. 62:26 The ball is crossed by Henri Lansbury, blocked by Jack Colback. 61:28 Foul by David Norris on Henri Lansbury, free kick awarded. Direct free kick taken by Andrew Surman. 61:28 Booking David Norris is shown a yellow card for unsporting behaviour. 59:31 Grant Leadbitter crosses the ball, save by John Ruddy. 57:57 The ball is sent over by Simon Lappin, Grant Holt takes a shot. Save by Marton Fulop. 57:49 Andrew Crofts delivers the ball, clearance made by Tommy Smith. 54:53 Tommy Smith concedes a free kick for a foul on Simon Lappin. John Ruddy takes the free kick. 54:25 Shot from 20 yards by Gianni Zuiverloon. Blocked by Leon Barnett. 54:06 The ball is sent over by Grant Leadbitter, clearance by Grant Holt. 52:58 Drilled left-footed shot by David Fox. Save made by Marton Fulop. 52:00 The ball is swung over by Andrew Crofts, Darren O'Dea makes a clearance. 50:39 David Fox takes a long range shot harmlessly clearing the crossbar. 50:07 Russell Martin produces a cross, clearance made by Tommy Smith. 49:34 Shot by Grant Leadbitter. John Ruddy makes a comfortable save. 48:22 Tommy Smith gives away a free kick for an unfair challenge on Grant Holt. Simon Lappin takes the direct free kick. 46:38 The ball is delivered by Simon Lappin, Tommy Smith manages to make a clearance. 45:22 Jack Colback fouled by Chris Martin, the ref awards a free kick. Direct free kick taken by Darren O'Dea. 45:00+4:16 The match has reached half-time. 45:00+3:37 Shot from 20 yards by Simon Lappin. Tamas Priskin makes a clearance. 45:00+2:59 Free kick awarded for a foul by Gianni Zuiverloon on Grant Holt. David Fox delivers the ball from the free kick right-footed from left wing, clearance made by Tamas Priskin. 45:00+0:56 Elliott Ward takes a shot from deep inside the box clearing the bar. 45:00+0:37 Corner taken by David Fox from the left by-line, clearance made by Gianni Zuiverloon. 45:00+0:22 Shot from 25 yards from Henri Lansbury. Grant Leadbitter manages to make a clearance. 45:00+0:15 Andrew Crofts delivers the ball, Tommy Smith manages to make a clearance. 44:40 Booking Henri Lansbury receives a caution. 44:31 Russell Martin delivers the ball, blocked by Jack Colback. 43:31 A cross is delivered by Russell Martin, Andrew Surman takes a shot. Marton Fulop makes a save. 42:02 Inswinging corner taken left-footed by Andrew Surman from the right by-line to the near post, David Norris manages to make a clearance. 41:34 Substitution Jason Scotland goes off and Colin Healy comes on. 41:13 Russell Martin crosses the ball, clearance by Gianni Zuiverloon. 39:04 Russell Martin gives away a free kick for an unfair challenge on Tamas Priskin. Free kick crossed by Grant Leadbitter, save by John Ruddy. 38:48 Andrew Surman takes a shot. Save made by Marton Fulop. 37:59 Corner taken by Andrew Surman from the right by-line to the near post, Effort on goal by Grant Holt from 12 yards. Tommy Smith gets a block in. 37:38 Russell Martin delivers the ball, Grant Leadbitter manages to make a clearance. 36:24 Damien Delaney challenges Grant Holt unfairly and gives away a free kick. David Fox takes the free kick. 36:24 Sent off Red card for Damien Delaney. 34:43 Assist on the goal came from Henri Lansbury. 34:43 GOAL - Grant Holt:Norwich 2 - 1 Ipswich Goal scored by Grant Holt from deep inside the penalty area low into the middle of the goal. Norwich 2-1 Ipswich. 33:28 Foul by Tommy Smith on Grant Holt, free kick awarded. Free kick crossed right-footed by Russell Martin, clearance made by Damien Delaney. 32:25 Tamas Priskin gives away a free kick for an unfair challenge on Leon Barnett. Elliott Ward takes the direct free kick. 30:40 Carlos Edwards produces a cross. 30:32 Centre by David Norris, clearance by Leon Barnett. 30:01 The ball is crossed by David Norris, clearance made by Simon Lappin. 29:23 Jason Scotland is caught offside. John Ruddy takes the free kick. 28:12 Foul by Leon Barnett on Jason Scotland, free kick awarded. The ball is sent over by Grant Leadbitter, Tamas Priskin takes a shot. The assist for the goal came from Tamas Priskin. 28:12 GOAL - Damien Delaney:Norwich 1 - 1 Ipswich Damien Delaney finds the net with a headed goal from inside the six-yard box. 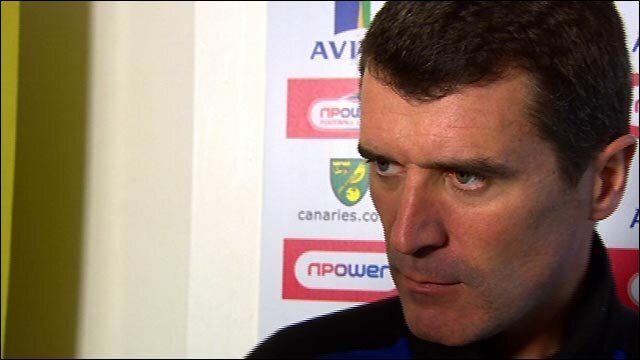 Norwich 1-1 Ipswich. 26:07 Leon Barnett challenges Jason Scotland unfairly and gives away a free kick. A cross is delivered by Grant Leadbitter, Header from deep inside the area by Tamas Priskin goes harmlessly over the crossbar. 25:36 Corner taken left-footed by Jack Colback, Grant Holt makes a clearance. 25:11 Jason Scotland produces a cross, blocked by Russell Martin. 24:59 The ball is swung over by Carlos Edwards. 24:20 Inswinging corner taken from the left by-line by David Fox, Andrew Crofts takes a shot. Marton Fulop makes a fantastic save. 23:56 The ball is crossed by Grant Holt, Darren O'Dea makes a clearance. 23:23 Shot from just outside the box by Henri Lansbury goes over the bar. 22:36 Drilled left-footed shot by Jason Scotland. Save by John Ruddy. 19:31 Effort on goal by Simon Lappin from just outside the area goes harmlessly over the target. 19:22 Grant Holt crosses the ball, Damien Delaney manages to make a clearance. 19:13 The ball is crossed by Simon Lappin, Jack Colback makes a clearance. 17:10 Effort from 18 yards by Jason Scotland. Blocked by Simon Lappin. Drilled right-footed shot by Tamas Priskin. Blocked by Leon Barnett. 16:13 Free kick awarded for a foul by Tamas Priskin on Leon Barnett. Elliott Ward takes the free kick. 15:39 Simon Lappin crosses the ball, Headed effort from deep inside the penalty area by Grant Holt misses to the right of the target. 15:34 The ball is crossed by Grant Holt, clearance made by Damien Delaney. 14:22 The ball is swung over by Tamas Priskin, John Ruddy makes a clearance. 13:26 Jack Colback crosses the ball. The referee blows for offside. Free kick taken by John Ruddy. 12:17 GOAL - Grant Holt:Norwich 1 - 0 Ipswich Grant Holt fires in a goal from just inside the area to the bottom right corner of the goal. Norwich 1-0 Ipswich. 11:58 Outswinging corner taken right-footed by Carlos Edwards played to the near post, clearance made by David Fox. 11:26 The ball is sent over by David Norris, blocked by David Fox. 7:33 Gianni Zuiverloon sends in a cross. 6:19 A cross is delivered by Henri Lansbury. 5:46 Free kick awarded for an unfair challenge on Grant Holt by Damien Delaney. Direct free kick taken by Elliott Ward. 5:14 David Fox challenges Jason Scotland unfairly and gives away a free kick. Free kick taken by Marton Fulop. 5:07 Simon Lappin delivers the ball, Damien Delaney makes a clearance. 4:15 Grant Holt gives away a free kick for an unfair challenge on Jack Colback. Marton Fulop takes the free kick. 4:15 Booking Booking for Grant Leadbitter for unsporting behaviour. 3:41 Booking Grant Holt booked for unsporting behaviour. 1:20 Grant Leadbitter takes a shot. Save made by John Ruddy. 1:09 Centre by Gianni Zuiverloon, Elliott Ward makes a clearance.